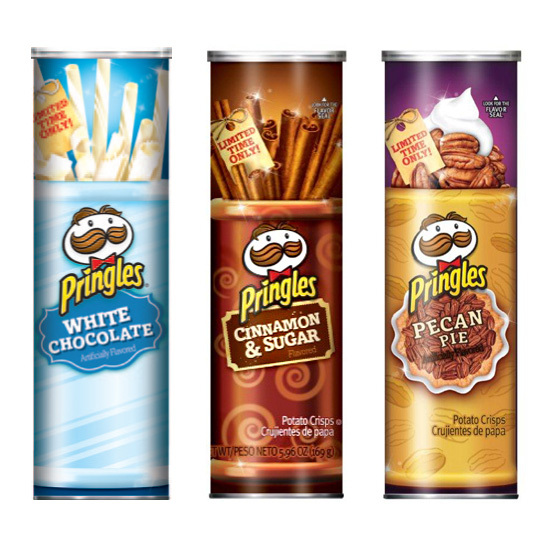 The people at Pringles have finally snapped. Not content with shilling salty snacks all year long, the chip maker is offering five sweet holiday flavors, including two new styles. Three of your old favorites (?) are back: cinnamon and sugar, pecan pie and white chocolate. New to the mix for this holiday season: milk chocolate and cinnamon sugar tortillas. Can you say Feliz Navidad? What are the new flavors like? The disappointed people over at People described the milk chocolate variety, saying, “You would assume [they] are salty, crispy chips dipped and smothered in decadent milk chocolate. Nope, not at all: These are standard crisps seasoned with chocolate-flavored sprinkling.” Meanwhile, Junk Food Guy gave the cinnamon sugar tortillas variety his seal of approval, despite previously rating the regular potato chip version of cinnamon and sugar as meh. So maybe that’s something. All five flavors are marked as “limited time only,” so if you want to give these a try, get a move on. And if you want to try the new flavors, get a move on to Walmart—those two varieties are exclusive to the mega-retailer.